Sorry Chicago Cubs fans, looks like you’re going to have to wait another 100 years for that elusive next World Series win. 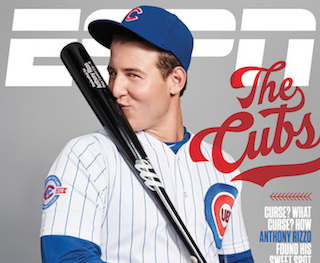 We say that because ESPN The Magazine not only announced the Cubs curse was over, it dedicated an entire issue to the team. If that’s not a full-scale jinx, we don’t know what is. The only hope Cubs fans have is to buy every single issue and burn them all. Short of that, it’s all over. Might as well stop playing now.